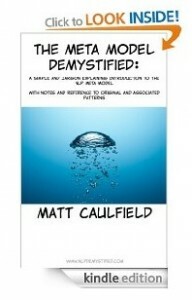 I have produced a series of ebooks, audio mp3’s and eCourses to help you practice, improve or revise specific area’s of NLP, I add to, revise and update these products on a regular basis. I have written a range of ebooks on a variety of subjects realiting to NLP. These books are exclusively available via Amazon Kindle store. Why Kindle? Because Kindle publishing gives you the most flexible way to read the book. You don’t need to own a Kindle to, you can download the (free) Kindle reader app for your phone, tablet, or PC. 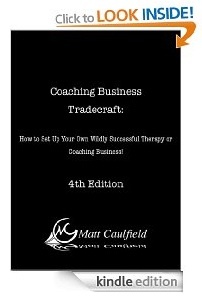 There are hundreds of courses out there that will teach you how to be a coach or a therapist. None tell you how to run a coaching or therapy BUSINESS. This ebook plugs the gap and will teach you, step by step, how to set up, run and build your very own professional coaching or therapy practice – from start to freedom. Your Journey to Success Starts Here! Click here to learn more. The Meta Model, the most powerful pattern or model that NLP has developed is poorly taught, poorly understood and poorly used. This eBooklet is an attempt to undo this confusion and present the Meta Model in a way that is clear to understand and, most importantly, use correctly. 29 pages. Click here to learn more. Don’t Do Something, Just Sit There! 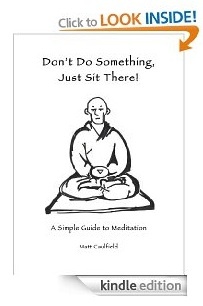 Meditation is the simplest thing to do in the world, but it can seem confusing to those that are new to the subject. This ebook teaches, form scratch, in simple termonology, how to develop a rewarding meditative practice. 49 page eGuide pdf. Click here to learn more. PLEASE NOTE: DUE TO EU VAT LAW CHANGES I NO LONGER SELL PRODUCTS TO THE EU OUTSIDE OF THE UK. THE REST OF THE WORLD IS UNAFFECTED. PLEASE DO NOT PURCHASE IF YOU LIVE IN THE EU. MY APOLOGIES FOR THE INCONVENIENCE. Below are some ebooks and audio mp3’s that I have created to help you practice and perfect your NLP skills. NLP training is the start of your journey not the end. 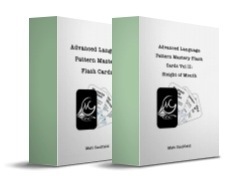 To practice, revise and perfect your NLP skills I have released a series of ebooks. To save you time and money I have bundled them together here. 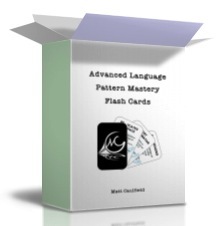 You get The NLP Exercise eManual, The Advanced Language Pattern Cards Vol 1 and the Little Book of NLP Techniques. Buy as a bundle and save £6 (20%). In this audio programme you will be taken through a simple exercise that will help you deeply relax and remove all that tension and stress from your body and mind and allow you take on life with an increased sense of well being, confidence and vitality. It is often said that NLP is "an attitude that leads to a methodology, that leaves behind a trail of techniques". Techniques are not NLP, they are what is left behind. But some techniques have become so interlinked with the idea of NLP that they cannot be ignored. Contains 25 of the classic NLP techniques. A good communicator takes responsibility for all nuances of their communication. Yet, it astounds me how many professional communicators and NLPers pay very little attention to the quality of their speaking voice. In this 2-hour audio programme you will be taken through the exact steps required to develop a pleasant and compelling speaking voice. Including the same vocal warm up I use before trainings or other speaking engagements. There are hundreds of books written about NLP or related fields. Some are brilliant, some are rubbish, how do you know which ones to read? Click on the link below (opens in new window) to go to my Amazon book store, where you will find a list of books that I recommended reading. Make sure you look at the menu bar on the right hand side to see different catagories. (more gems will be added as I find them).